Black holes are notorious for pulling things toward them. But in some cases, black holes can act as powerful engines to blast material away. One of those black holes is found in Cygnus A, a large galaxy embedded within in a cluster of galaxies. Cygnus A’s black hole is blasting a jet — a tightly-wound column of material — away from it at extremely high speeds. Astronomers found that his jet ricocheted off a wall of hot gas, then punched a hole in a cloud of energetic particles, leaving behind a gigantic hole. By studying this kind of behavior, scientists can better understand how black holes affect their surroundings. 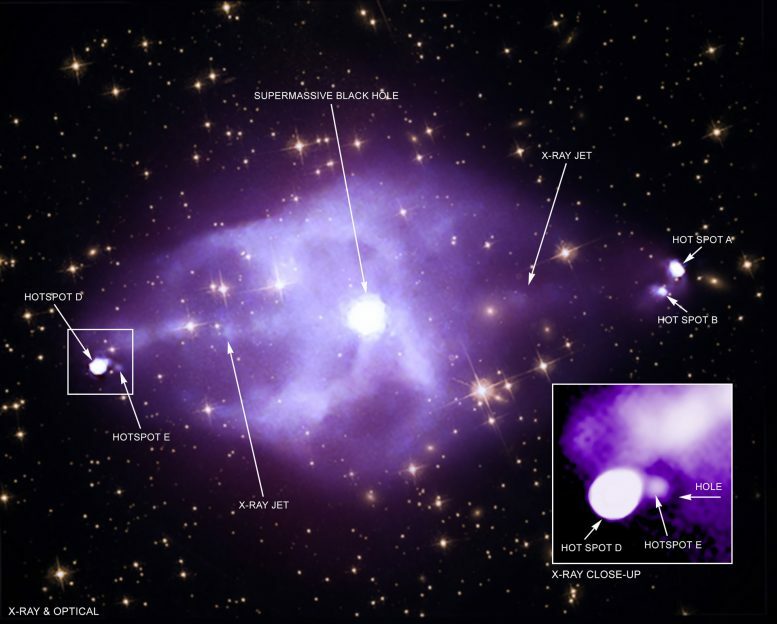 Only an X-ray telescope with the sharp vision of NASA’s Chandra X-ray Observatory could make such a discovery. The scientists are working to determine what forms of energy — kinetic energy, heat or radiation — the jet carries. The composition of the jet and the types of energy determine how the jet behaves when it ricochets, such as the size of the hole it creates. Theoretical models of the jet and its interactions with surrounding gas are needed to make conclusions about the jet’s properties. Be the first to comment on "Chandra Views Never Before Seen Behavior From Giant Black Hole"